Breaststroke seems to be the most common swimming stroke, and many people see it as the easiest one, but it is also the one that is often done inefficiently. It is a badly named stroke in some ways because in breaststroke the power should come from the legs. Think of a frog. It has strong, powerful back legs and tiny feeble little arms. For most of us our legs are stronger than our arms and it makes sense to use them. But maybe because we call it breaststroke, many people use their arms to propel them forwards, which is very inefficient and makes it difficult to breathe effectively. A strong but gentle leg kick should propel you into a smooth glide with your face in the water in order to maintain a streamlined position. Breathe out as you glide forward, then use a smallish circular arm movement to lift your head out of the water to inhale. Add in a gentle undulation, angling your head downwards as you breath out and directing your body upwards for the in breath, and you will have a smooth, relaxing, gentle, yet powerful stroke. Here is a good clear description of how to achieve a stress free breaststroke. 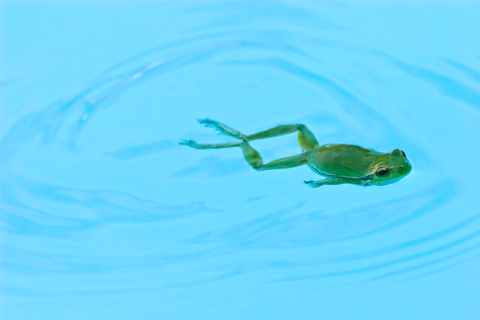 This entry was posted in learning to swim and tagged breaststroke, mindful swimming. Bookmark the permalink.